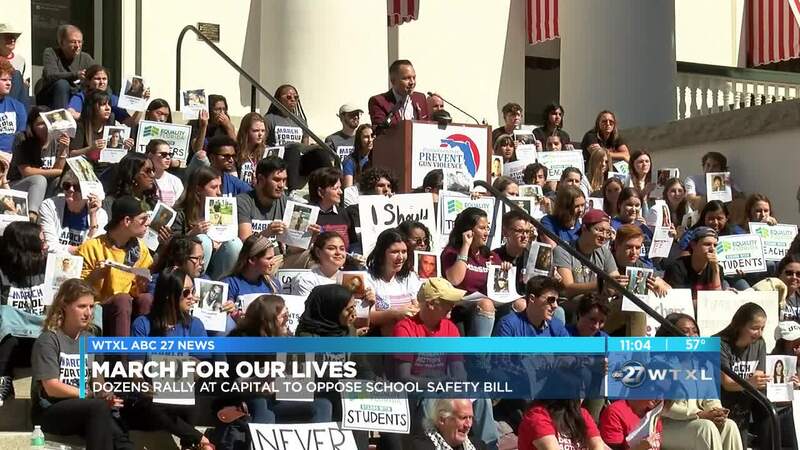 TALLAHASSEE, Fla. — Survivors of the Parkland shooting, other students, teachers, and lawmakers rallied at the capital in opposition of a controversial school safety bill. The bill in question would expand the school guardian program and allow trained-teachers to be armed. Those who rallied believe that's a re-active answer and could lead to an innocent bystander getting seriously hurt in the event of a school shooting. Instead those who took to the podium suggested a more pro-active approach focus on training school resource officers better and bringing in more counselors. "We need to consider solutions that are proactive. Solutions, for instance, that involve funding mental health or investing in more counselors at schools. Solutions that will not provoke more violence. Teachers should receive more training and how to perform practices, and not how to shoot a gun," said Zion Kelly, Gun Violence Prevention activist. This school safety bill has been temporarily postponed but these students and lawmakers who opposed it plan to keep fighting.